Carbon-Based Nanoelectromagnetics provides detailed insights into the electromagnetic interactions of carbon-based nanostructured materials such as graphene and carbon nanotubes. Chapters within the book offer a comprehensive overview on this discipline, starting with an introduction to the field-matter interaction, its features, and finally, its applications in microwave, THz and optical frequency ranges. Electromagnetics at the nanoscale level has become a major research area in recent years as the synthesis of a variety of carbon-based nanostructures has progressed dramatically, thus opening the era of nanoelectronics and nanophotonics. To meet the challenges of these new fields, a thorough knowledge is required of the peculiar properties of the electromagnetic field. The novel behavior of the electromagnetic fields interacting with nano-sized elements and nano-structured has motivated the birth of this new research discipline, ‘Nanoelectromagnetics’. Antonio Maffucci is Associate Professor of Electrical Engineering at the University of Cassino and Southern Lazio. Since 2014, he has also been associated to the INFN, Frascati National Laboratories. His research focuses on issues of electromagnetic and circuit modeling, computational electromagnetics, electromagnetic compatibility, nanotechnology. He is the author of 160 international publications, 3 reviews, 1 book, 7 book chapters and 4 receiverships. Sergey Maksimenko is Professor at and Director of the Institute for Nuclear Problems, Belarusian State University, Minsk, Belarus. 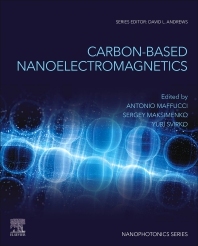 His main research focuses on the electromagnetic properties of different forms of nanocarbon including carbon nanotubes and graphene, and the design and development of nano-carbon based electromagnetic materials for terahertz and microwave applications. Yuri P. Svirko is Professor at the Institute of Photonics, University of Eastern Finland. His research interests concern nonlinear optics, carbon nanomaterials and plasmonics. Prof Svirko is a co-author of about 190 publications in peer-reviewed journals and two research monographs.